You know what's a real pain? Boiling water in a large pot with another, smaller pot or glass bowl over it to melt things like chocolate or beeswax or sugar in egg whites. I don't even want to talk about how many batches of chocolate have seized up on me, or how many times I've had to start meringue over because the smaller pot or bowl plopped into the boiling water below. Double boilers and I aren't friends. So I avoid making homemade beauty products. They almost always require me to melt the beeswax and fat over a double boiler. It has this handy little “Keep Warm” button. 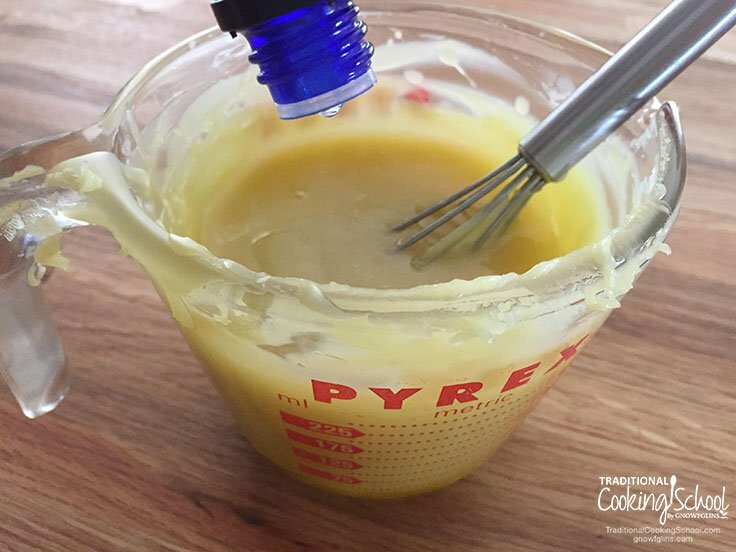 Could that work for melting fat and beeswax WITHOUT the dreaded double boiler? Instant Pot hard lotion bars, here I come! And would you believe I melted, without burning, beeswax and cacao butter in 13 minutes?? I know I'll never make hard lotion bars without my Instant Pot again! Double boilers and I aren't friends. But then, the Instant Pot... It has this handy little button that says "Keep Warm" -- and it works for melting fat and beeswax WITHOUT the dreaded double boiler! 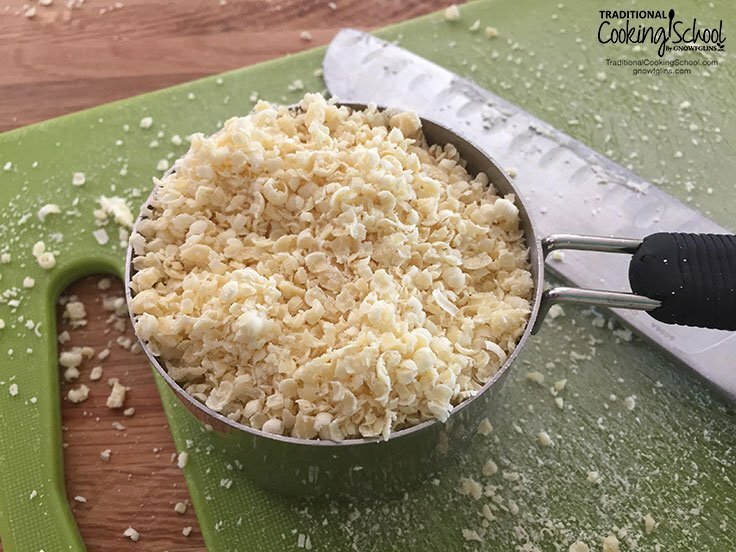 I know I'll never make hard lotion bars without my Instant Pot again! Begin by grating the cacao butter and beeswax. Grate first, then measure into a 1-cup dry ingredient measuring cup. 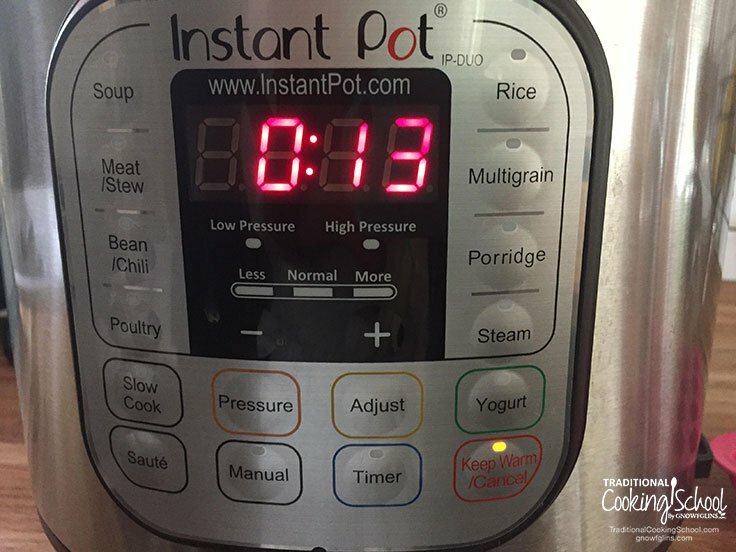 Press the "Keep Warm" button on the Instant Pot. Next, add grated cacao butter, grated beeswax, and olive oil to the Instant Pot. In 12 to 13 minutes, it's all melted! Transfer the melted oil/wax mixture to a glass cup with a pouring spout. Whisk in Vitamin E oil, if using. Pour into molds or a muffin tin. Set aside to harden or place into the fridge to speed up the hardening time. Finally, wrap in parchment and tie with twine to give as a gift, or store in an airtight container. I grated my cacao butter and beeswax first. This significantly cut down on the melting time — and my Salad Shooter made it a breeze! If you start with blocks of cacao butter and beeswax, your melt time will be significantly longer. These bars smell and feel ah-mazing without any additional scents, so the use of essential oils is completely up to you. Should you decide to use essential oils, choose a skin-nourishing oil, such as ylang-ylang, cypress, lavender, sandalwood, or frankincense. I chose cypress essential oil, and it pairs beautifully with the chocolate scent of cacao butter! Plus, it's a gender-neutral scent, so the male members of my family won't mind using these hard lotion bars! 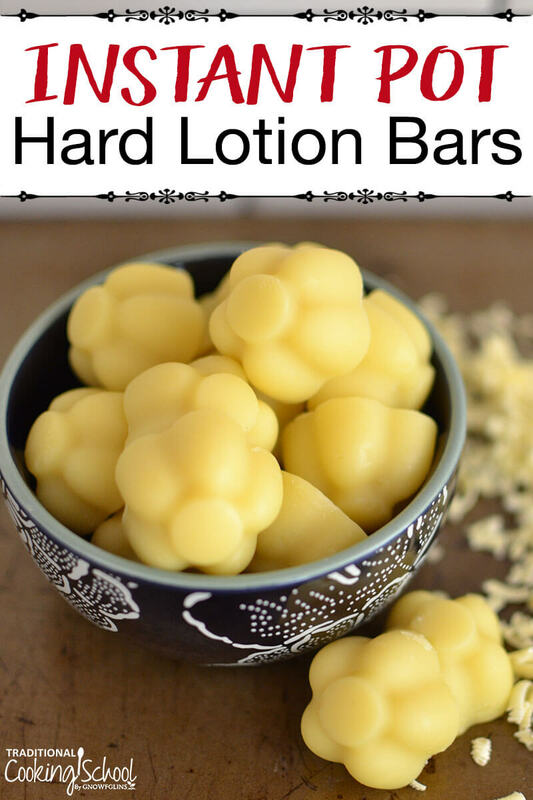 Did you know that you could make hard lotion bars in the Instant Pot?! This post was featured in 25 Natural Gifts For The New Mom On Mother's Day. Could I melt the ingredients inside a Pyrex measuring cup INSIDE the IP pot? I’m a wee bit clumsy and I’d rather not have melted cocoa butter and beeswax all over my counter or me! ???? I’m sure you could, Tracey. I haven’t tried it this way, so please let me know how it turns out if you do! How is clean up of the Instant Pot when you are done? If the pot is still hot/warm and you’ve scraped as much of the lotion mixture out as possible, hot water and dish soap will work fine. I had no issues cleaning up my IP. Also, the stainless pot is dishwasher-safe. My IP isn’t permanently coated in wax! 🙂 If the pot is hot/warm, some hot water and dish soap work just fine. Also, I put my pot in my dishwasher sometimes too. I’m wondering about cleaning the instant pot as well. Do you use a dedicated pot? Nope, Sally, no dedicated pot. If the pot is hot/warm and you’ve used a spatula to scrape all the lotion mixture out of it, some hot water and your favorite dish soap will do the trick. I didn’t have any issues getting my pot clean! How about an herb infused oil with the beeswax, to make salve? Would the oil get too hot? How do u clean the pot after?? The pot cleans up quickly if it’s warm/hot and you use hot water and your favorite dish soap. I didn’t have any issues getting it clean! Does anyone know what temperature the stay warm setting is? Also the yogurt setting might work for infusions? But I’ve had trouble finding temperatures for those settings. Can I ask a silly question on how you use hard lotion? That’s not silly, Melisa! I put the bar in my palm and rub it over my skin. Your body temperature will slowly melt it so you can rub it in. Hard lotion bars are also great for traveling if you don’t want to risk a bottle of lotion leaking in your bag. I have a little metal tin that I keep one in inside my purse. I am trying to figure out how much ingredients to buy. How many of those mold trays (shown in the picture) were you able to fill up? Thank you!!! That is actually the form for flower-shaped ice cubes, so they are pretty small! I had quite a bit of lotion leftover that I allowed to harden in silicon muffin liners. The flower mold was just too cute for the photo. 😉 So I honestly can’t say how many mold trays I would have used; it would depend on the size of each mold. Muffin liners (silicon or paper) actually make excellent molds for hard lotion bars, and there’s no need to buy something special! Hope that helps! How long do they take to harden enough to pop them out? Depends on the temp of your house or if you put them in the fridge or freezer to harden. Mine were ready to pop out within a few minutes because I put them in the freezer! Do you leave the lid off during the keep warm cycle? thanks totally new to this and I was trying to figure it out 🙂 Can’t wait to try this. Won’t this bar melt during summer ? Does it give lather ? The beeswax will keep it from melting, but it will soften considerably if left at warm temperatures for long periods. No, it doesn’t lather. It’s lotion, not soap. Hi there, can you sub coconut oil for the olive oil? You can, Danielle. Coconut oil, however, doesn’t work as well on some peoples’ skin. It can actually have a drying effect on some people. That’s why I chose olive oil. I’m going to try with almond oil instead of olive oil. What do you think? can you use shea butter instead of cacao? Do you know the weight of the ingredients before grating? I find it easier to weigh and then grate (cheese for instance). No, I always grate, then measure. Great idea! Do you think we can use avocado oil instead of the olive oil? Why can’t you just use the keep warm option on your stove with a regular pot? Can you use any dyes to change the color without it transferring to skin? I’m not sure, Julie, as we at TCS prefer not to use chemical dyes. You’ll have to experiment with natural dyes (maybe turmeric or activated charcoal?) and let us know how it turns out for you! These were super easy. I find the bars a bit greasy for my taste. I’m thinking of remelting them and adding more beeswax or cacao butter. Which do you suggest? More cacao butter adds more fat, which will likely make them greasier. Perhaps beeswax? Could I use an old crock pot to make lotion in instead? PS: You can use any liquid oil and any butter you like as long as you keep the same ratio, 1/3 each butter, oil, and beeswax. PPS: You could safely use up to 100 drops of essential oil and still be under 1%. No, Katie, you don’t need to use the lid at all. You are not pressure cooking with this recipe — just using the Keep Warm function. Hope that helps! So how do you keep your lotion from cracking in the mold?! All of mine cracked! ? Hmmmm, I don’t know, Kelsee! That never happened to me. Maybe they were in the freezer too long? I honestly have no clue. I’ve worked with beeswax for making candles and sometimes they will crack if they cool down too quickly. Mold size could also make a difference. I’m considering trying to substitute lanolin for some of the other oils. Do you think that might work? Any helpful hints? 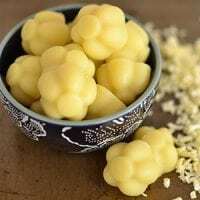 Where can I find beeswax and cacao butter? I’ve got a Michaels/ac moore/and hobby lobby near me! I’m not sure if craft stores carry cocoa butter, but most will have beeswax for candle making. Some natural groceries have cocoa butter, Shea butter, etc. I usually get my products from Amazon.